Check out the video interview I did with Polity.org.za. It’s a website maintained by Creamer Media. I had a great chat with Sheila Barradas, Research Coordinator and Deputy Editor: Research Channel Africa about “Paper Sons and Daughters”. We kicked off with some of the history of the Chinese, arriving from the 1660s to the impact of the mighty Chinese dragon breathing on the continent right now. We chatted about the meaning of the title – of the men and women who arrived here as stowaways and borrowing the identities of established family, taking their names and becoming their paper sons and daughters. Our conversation moved to fahfee, picking up on this as the metaphor of the hidden and the invisible and also the realities of exclusion and segregation for communities pushed towards society’s edges. It was great to explore the questions of belonging, truly, honestly, warts and all. It’s what we need: more conversations, getting to know each other better and to give context to the many stories that knit together our great South Africa story. This review completes a loop in many ways – I completed anthropology honours at Wits and my anthropology studies have in so many ways laid the foundation of my book. One thing I like to recount is a relatively small assignment on mapping out your family tree. It was part of a section on kinship studies when I enrolled for first year anthropology at the University of Johannesburg under Professor Thea de Wet. My intention then was to do anthro purely for enrichment and non-degree purposes. Being asked to write my family’s story started that inward journey that I never before took as a writer and also as a journalist who reports on other people’s lives and stories. The study bug did take a deep bite, and I’m grateful for it. From the journey of “just for personal enrichment” my anthropology studies turned to joining the honours programme at Wits University a few years later. There my research essay ended up being on fahfee and identity, under my supervior Dr Pamila Gupta. I titled my paper “The Invisible Thread that Binds – fahfee, a metaphor of stigma, shame and secrecy”. And of course “Paper Sons and Daughters” is never far from the framing set by fahfee and the invisible lives that take shape in these shadows. Great news this October, Paper Sons and Daughters is as now in its second print run. Thank you everyone for connecting with the book, cheering on the stories and sharing your own with me – that’s been such a gift! Commissioner Street throbs , the one-way traffic rushes towards the blue wall of Joburg Central Police. But two blocks before the road disappears behind the bend to Fordsburg is old Chinatown. I took a walk there on a crisp Thursday morning this week with the Mail and Guardian’s Lauren Clifford-Holmes. It’s a journey back to the Chinatown of the first Cantonese in the city. We still gather here for “‘Siu Yee”, to appease and show respect for the hungry ghosts”” released from the realms of the dead and the ancestors over this period. We still drop in at shops at this Chinatown to leave a donation for the family of someone who has passed on and it’s here that some uncle and or some aunty will still offer you a cooldrink or a cup of Chinese tea. This week it was the hospitality of Jane at Siu Hing Hong and all of Walter Pon’s generous staff. Thank you Siu Hing Hong staff! Lauren’s video is a run-up to the Mail and Guardian’s Literary Festival. This year’s festival is a celebration of the city of gold – this concrete jungle with its heart in its mines, but also in the spiritedness of those who call themselves Jozi’s people. Have a stunning weekend everyone! Thanks for all the support and interest about “Paper Sons and Daughters” from people spread across our wonderful planet. Great news: ‘Paper Sons and Daughters’ is now available on Amazon.com as an ebook. All you great people who no longer live on our sunny South African shores can now buy the book from Amazon for your kindles, iPads, laptops and whatever other gadgets you love … Guess it is the end of reading in the bath! Enjoy and thanks for the interest and support! I chatted to Trish Beaver from the Natal Witness about “Paper Sons and Daughters” recently. We got talking about identity and belonging, about the collision of the personal and the collective when we say “this is who I am”. It’s a process that gets made, unmade and made all over again as we stretch our legs and will them on, on this glorious journey of life. I told her why the book has broken my heart a million times over, but why I also had to write it to remember and to move forward with the conversations and stories that are still to be told in our great country. Read her feature and review, called “No Longer Invisible”, by going to this URL http://www.witness.co.za/index.php?showcontent&global%5B_id%5D=66678. Have a great Sunday out there – Joburg is jasmine-scented right now and so ready for spring. It’s the promise a magic week ahead! Enjoy everyone! Really enjoyed my Women’s Day chat with John Robbie on Radio 702 yesterday. 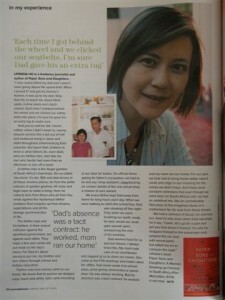 In the latest ‘Women and Home’ magazine (June 2011) there’s a Dear Dad feature. I write about learning to drive with my dad, the fahfee man who has hardly an hour to spare on weekends, but still found some time to take me for a spin around the neighbourhood, held his breath when I screeched to a halt or spun the the tyres when I didn’t mean to. It’s an ode to all fathers this Father’s Day and a ode to mine, Sing Kee Ho. Enjoyed so much chatting with the EB Bedfordview bookclubbers this morning. Felt like being in the “hood”, having known Jozi East all my life. All the memories of growing up in Bertrams and Judith’s Paarl… Love sharing stories that make us realise how we really do mirror each other lives. The Greek women who remembers that growing up they were “banned” from going out with non-Greek guys, or were banned from going out al all, because parents were so strict. Memories of the fahmee man arriving at the street corners and children being asked about their dreams for bets. “It was like an honour in my family if your dream was the one that got us a win from the fahfee man,” one lady remembers. It was a time when when ice-cream vans still got the thumbs up from parents and no one was lactose intolerant; when a R1 felt like a sure thing with its Springbok and its dominant size meant it ruled in my mom’s purse. Take a look at Michael Bleby’s article today about ‘Paper Sons and Daughters’ in ‘Business Day’. It’s about the book, but also about me being late for our lunch and imaging I could schedule appointments down to a 15-minute window. Yeah right, who would I be kidding! THOUGHT I’D SHARE THE FULL TRANSCRIPT OF WHAT I WROTE IN RESPONSE TO SIBUSISO’S QUESTIONS – THERE’S STUFF HERE ABOUT WOOD EAR FUNGUS, BEE AND EVEN THE JHB PHOTOWALKERS! SM: Most people know that you are a writer and you love photography. How would you describe yourself? Does Paper Sons and Daughters depict you in a different light? UH: THIS IS A CHILDHOOD MEMOIR SO I GUESS IT IS ABOUT MY LIFE BEFORE JOURNALISM. BUT THE BOOK IS ABOUT THE JOURNEY TO ADULTHOOD IN A WORLD WHERE I STRADDLE TWO WORLDS, ONE OF BEING A SOUTH AFRICAN GROWING UP IN APARTHEID SOUTH AFRICA AND AT THE SAME TIME HAVE THIS UMBILICAL LINK TO AN IMAGINED CHINA THAT IS STILL THE MEMORY AND THE MOTHERLAND OF MY PARENTS AND GRANPARENTS. SO PERHAPS NOT SO MUCH A DIFFERENT LIGHT BUT MORE DIFFERENT SHADES OF WHO I AM AND THE INFLUENCES, EXPERIENCES THAT HAVE BOUGHT TO THIS POINT IN MY LIFE. SM: The Chinese are a minority in South Africa. Do you think more can be done to increase awareness the Chinese people’s plight? What do you hope the book will achieve? UH:I WOULDN’T SAY THERE’S A “PLIGHT” AS SUCH. I DO THINK THAT WE NEED MORE AWARENESS ABOUT EACH OTHER AS SOUTH AFRICANS IN GENERAL. WE NEED TO BE ABLE TO EXPLORE THE SUBLTETIES, THE CONTEXT AND THE COMLEXITIES THAT MAKE UP WHO WE ARE AS DIVERSE COMMUNITIES WHO SHARE THIS COUNTRY. IT’S IN WANTING TO UNDERSTAND THROUGH AUTHENETIC, SINCERE EXCHANGE THAT WE CAN MOVE AWAY FROM STEREOTYPES, EASY ASSUMPTIONS AND PREJUDICES. I DO THINK WE CAN EVEN FIND MORE COMMONGROUND. THE RESPONSES TO THE BOOK FROM SO MANY ORDINARY PEOPLE (THAT’S ALL OF US, TO ME) HAS BEEN SO AMAZING BECAUSE IT’S ABOUT CONNECTING WITH WHAT WE MIRROR IN EACH OTHER. I’VE SAID OF THE BOOK: A LITTLE BIT OF MY STORY IS YOURS AND A LITTLE BIG OF YOURS IS MINE, AND I REALLY DO BELIEVE THAT. SO, IF ‘PAPER SONS AND DAUGHTERS’ BOOK STARTS THOSE CONVERSATIONS, THOSE HONEST EXCHANGES, IN SOME SMALL WAY THEN GREAT. IMPORTANTLY FOR ME PERSONALLY, THIS BOOK IS ALSO ABOUT GIVING VOICE TO THE MEN AND WOMEN LIKE MY PARENTS. THESE ARE THE HARD WORKING FAHFEE MEN AND WOMEN, THE SHOPKEEPERS – THE PEOPLE WHO SACRIFICED SO MUCH, WHO WERE PUSHED AGAINST THE MARGINS OF SOCIETY AS THE UNWANTED YELLOW MAN IN APARTHEID SOUTH AFRICA. THEY STRUGGLED, NOT POLITCALLY, BUT SOCIALLY AND ECONOMICALLY AND YET THEY CARRIED ON AND PERSEVERED AND IT WAS ESSENTIALLY FOR ME AND MY GENERATION. SM: You are a freelance writer, journalist and a keen photographer. Why do you think that photos are more effective than text? SM: What is your fondest memory from your childhood, being the child of migrants? UH: THERE HAVE BEEN SO MANY. IT WASN’T ALWAYS EASY TO MERGE THE EQUALLY POWERFUL INFLUENCES IN MY LIFE. I WOULD SAY THAT SETTING THOSE TWO PARTS SIDE BY SIDE AND SEEING THEM AS PARALLEL GIFTS IT WHAT MAKES ME LOOK AT THEM WITH SO MUCH RESPECT AND GRATITUDE AS A GROWN-UP. IT’S SUCH A FANTASTIC MIXING AND MELDING, A BIT LIKE WHAT I SAY IN THE BOOK ABOUT THE TREAT OF RUNNING AFTER THE ICE-CREAM TRUCK OF THE SUBURBS OF THE 80S AND WAITING FOR THE DELICIOUS, CREAMY DAIRY FLOPS TO HIT THE WAITING CONES, BUT THEN SITTING FOR DINNER THAT NIGHT, EATING WITH CHOPSTICKS AND RICE BOWLS AND TUCKING INTO SOMETHING LIKE WINTER MELONS AND “WOOD EAR” FUNGUS OR STEAMED EGGS WITH SOYA SAUCE AND A SPLASH OF SESAME SEED OIL IN MY MOTHERS’ KITCHEN. SM: You regularly take part in photo walks. Can you take us through a typical photo walk? UH: I DID THE PHOTOWALK AS THE ‘CHINATOWN OF MY CHILDHOOD’ LINKED TO THE LAUNCH OF THE BOOK. FIRST CHINATOWN, AS THE LOCAL CHINESE CALL IT, WAS WHERE THE CHINESE SET UP A CANTONESE CLUB, WHERE FOODS THAT WERE ‘STRANGE’ AND ‘WIERD’ COULD BE BOUGHT, WHERE THE COMMUNITY STILL GATHER FOR A SUNSET LATE LUNCH AFTER A FUNERAL. WHEN I WAS GROWING UP IT WAS WHERE MY FATHER, AS A FAHFEE MAN, WENT TO BUY THE FAHFEE BETTER SHEETS AND PURSES THAT HE NEEDED FOR THE BANKS THAT HE RAN FOR HIS BOSS IN THE TOWNSHIPS AND LOCATIONS ON THE OUTSKIRTS OF THE CITY. THIS PHOTOWALK WAS AN OPPORTUNITY SO SEE THIS PLACE THAT FEW OUTSIDERS VENTURE INTO. THIS PART OF TOWN HASN’T HAD THE REJUVENATION TREATMENT IT DESERVES. YET IT SURVIVES AND THERE ARE STILL MEMBERS OF THE COMMUNITY WHO HAVE RESTAURANTS AND SHOPS HERE. OF COURSE THERE ARE ALSO NEW CHINESE WHO HAVE ARRIVED. THE MAJORITY OF THESE NEW MIGRANTS ARE PART OF THE ‘THIRD WAVE’ OF MIGRATION INTO SOUTH AFRICA. THE ARE MOSTLY CHINESE NATIONALS STILL, NOT SOUTH AFRICANS. THEY HAVE ARRIVED POST 1994 AND POST 1998 WHEN SOUTH AFRICA RE-ESTABLISHED DIPLOMATIC TIES WITH CHINA. THE DISTINCTION IS IMPORTANT, BECAUSE OF COURSE PEOPLE LIKE MY PARENTS AND GRANDPARENTS WHO ARRIVED IN THE TIME BEFORE DEMOCRACY ARRIVED ESCPAPING A CRUMPLED AND BROKEN CHINA, THEY ARRIVED AS STOWAWAY, HAD TO RESORT TO BECOMING ‘PAPER SONS’, USING BORROWED AND BOUGHT IDENTITIES BECAUSE THEY WERE NOT WELCOME AS THE YELLOW PERIL AND THE GEEL GEVAAR IN APARTHEID SOUTH AFRICA. *FOR MORE ON THE PHOTOWALKERS, PER SE, I WOULD SAY PLEASE VISIT THE CLUB AT THEIR FACEBOOK PAGE UNDER ‘JOBURG PHOTOWALKERS’ – VERY COOL! SM: In the book, your gran says that your brother, who only lived for a few days, could have survived if he had seen modern doctors, but your grandad would not allow it. How difficult is it for you to maintain Chinese traditions in an urban city like jozi, where places like Chinatown are no longer only reserved for Chinese people? Are traditions important to you? UH: IT’S NOT MY BROTHER. IT’S MY MOTHER’S BROTHER, SO THE CHILD WHO WOULD HAVE GROWN UP TO BE MY UNCLE, HAD HE SURVIVED. THIS TAKES PLACE IN MY MOTHER AND GRANDPARENTS’ VILLAGE, NOT IN SOUTH AFRICA AND IT WOULD HAVE BEEN THE LATE 40S, EARLY 50S. IT’S LONG BEFORE THEY MAKE THE JOURNEY TO SOUTH AFRICA. OF COURSE THERE WERE MORE MODERN TREATMENTS IN PLACE EVEN THEN, DOCTORS WHO HAD WESTERN OR MODERN APPROACHES EVEN AT THAT TIME. HOWEVER, MY GRANNY WOULD HAVE RELIED ON THE CHINESE MEDICINES AND TRADITIONS SHE KNEW. BUT WHEN HER CHILD, HER ONLY SON, WAS AT RISK SHE WOULD HAVE CLUTCHED ONTO WHATEVER SMALL HOPES PRESENTED THEMSELVES TO HER. YES TRADITIONS MATTER TO ME, BUT I WOULDN’T SAY I’M “TRADITIONAL” NECESSARY THOUGH. I THINK THE DEFINITIION OF TRADITION ALSO HAS TO MAKE ROOM FOR A VERY PERSONALISED MEANINGS. IT MEANS DIFFERENT THINGS TO DIFFERENT PEOPLE, EVEN THOSE WITHIN THE SAME CULTURE. I UNDERSTAND AND EMBRACE THE ROLE OF TRADITION, THEY GIVE SHAPE TO THINGS, THE GIVE SYMBOLIC MEANING WHEN WE CAN’T YET KNOW ALL THE MYSTERIES OF LIFE. TRADITIONS, RITUALS AND RITES THAT CONTINUE TO HAVE CONTEMPORARY MEANING DO MATTER TO ME, BUT TRADITION FOR TRADITION’S SAKE LESS SO. CULTURE IS NOT STATIC, IT EVOLVES, IT ADAPTS AND NO ONE PERSON OR GROUP HOLDS ON TO IT THROUGH SKIN COLOUR OR THROUGH A HISTORICAL CLAIM. SO OF COURSE THE CHINESE CULTURE, THE TRADITIONS AND THE INFLUENCES DRAW IN ALL WHO ARE ATRRACTED TO IT, NOT JUST CHINESE PEOPLE. SM: It is a little known fact that the Chinese have been in SA from the 1600s. A few years ago, there was a ruling where the Chinese were afforded the opportunity to benefit from BEE what is your take on this? I’M OPPOSED TO BEE AS IT’S BEEN EXECUTED CURRENTLY IN SOUTH AFRICA. I WOULD PREFER THAT WE USE BEE ON A NEEDS-BASED MODEL AND DEFINITELY TO LOOK AT AN ‘SUNSET CLAUSE’. IN JULY 2008 THE DEFINITION OF BLACK, AS IT APPLIES TO BEE AND AA LEGISLATION, WAS EXTENDED TO INCLUDE CHINESE SOUTH AFRICANS, WHO WERE CLASSIFIED AS COLOURED BEFORE 1994. IT WAS A NINE-YEAR LONG COURT BATTLE THAT WAS ULITMATELY ABOUT AFFIRMATION THAT THE CHINESE WERE DISCRIMINATED AND OPPRESSED, JUST LIKE OTHER NON-WHITE GROUPS IN SA BEFORE 1994, IT WAS NOT ABOUT SHARES AND JOBS. INCIDENTALLY THIS RULING ONLY APPLIES TO FEWER THAN 10 000 PEOPLE, BECAUSE THERE ARE SO FEW CHINESE SOUTH AFRICANS IN THE COUNTRY NOW. AS I STATED PREVIOUSLY THE MANY NEW CHINESE IN OUR COUNTRY ARRIVED AFTER 1994 MOSTLY THESE PEOPLE ARE MIGRANTS AND ARE CHINESE NATIONALS. MOST IMPORTANTLY ONE OF OUR COMMUNITY LEADERS, MR PATRICK CHONG, SAID SOMETHING TO ME THAT HAS SUMMED UP WHAT BEE MEANS TO ME. I WAS HURT AND FRUSTRATED THAT THE ‘TOO WHITE FOR SOME, TOO BLACK FOR OTHERS’ LABEL STILL HAUNTS THE CHINESE SOUTH AFRICANS. MR CHONG SAID SOMETHING LIKE THIS TO ME: (IT’S THE SAME MESSAGE HE HAD FOR THE BLACK MANAGEMENT FORUM WHO OPPOSED THE HIGH COURT RULING) ‘UFRIEDA, YOU DO NOT NEED BEE, BUT WITH THIS COURT RULING, WE HAVE AN AFFIRMATION OF OUR ROLE IN THIS COUNTRY. YOU NEED TO USE THIS TO HELP BUILD THIS COUNTRY AND TO HELP ALL THOSE WHO TRULY NEED BEE’. I HOLD ON TO HIS WORDS. SM: Does your book correct or address misconceptions about the Chinese in south Africa? UH: IT CERTAINLY PRESENTS A STORY ABOUT ONE FAMILY’S EXPERIENCES, I HOPE HONESTLY AND SINCERELY . THROUGH TELLING THE STORY IT PRESENTS CONTEXT AND HOPEFULLY A GLIMPSE INTO LIVES THAT WERE DELIBERATELY HIDDEN BECAUSE OF OUR DIVIDED SOCIETY. THIS BOOK IS NOT A CRUSADE, BUT IT IS HOPEULLY AN INVITATION TO FOR US TO KNOW EACH OTHER BETTER. SM: You are also the first recipient of the Anthony Sampson foundation award. What has this meant for you? UH: THE AWARD WAS IN MANY WAYS INSTRUMENTAL IN ME STARTING THE JOURNEY OF WRITING THE BOOK. THE PROJECT I UNDERTOOK AS THE RECIPIENT OF THE AWARD WAS ON MIGRANTS IN SOUTH AFRICA. I STARTED THE PROJECT IN 2007, INCIDENTALLY A YEAR BEFORE THE XENOPHOBIC RIOTS RIPPED APART MUCH OF THE PROMISE OF OUR COUNTRY. I WORKED ON A THREE-PART INDEPTH REPORTING PROJECT. THE FIRST ARTICLE WAS ABOUT ‘THE MIGRANTS IN MY KITCHEN, SO TO SPEAK, MY PARENTS’. THE SECOND PIECE WAS ABOUT NEW CHINESE MIGRANTS, THE TENS OF THOUSANDS WHO HAVE ARRIVED IN SA SINCE THE EARLY 90S AND THE THIRD PIECE WAS ABOUT JOBURG EAST’S CONGOLESE COMMUNITY. I WANTED TO RUN A THREAD THROUGH THE STORIES THAT SHARE THE THEMES OF EXCLUSION AND IDENTITY, HARRASSMENT, STEREOTYPE AND STIGMA. THIS THREAD RUNS ACROSS COMMUNITIES AND ACROSS TIME. THE FIRST PART WAS WHAT HELPED SPARK THE BOOK. THE ANTHONY SAMPSON FOUNDATION AWARD, IN THE SPIRIT OF A TRUE LIGHT OF SA JOURNALISM, IS A REMINDER FOR ALL OF US WHO REPORT, WHO WRITE AND WHO BELIEVE IN THE VARIED STORIES OF OUR COUNTRY, TO KEEP LOOKING DEEPER, TO BE MORE CRITCALLY AWARE AND OF COURSE TO KEEP WRITING. “Paper Sons and Daughters” was launched this past Wednesday (13 April 11). It was a gorgeous evening and the books in stock sold out that evening. Thank you everyone for the great energy and the support. Read more extracts and reviews in this weekend’s Saturday Star and Sunday Independent. In this week’s “Jewish Report” (May 11 – 20, 2011) Gwen Podrey has reviewed “Paper Sons and Daughters”. Her review runs under the headline “Powerful testimony of courage”. – Give it a read! Radio Today – interview with Paul Pereira on his show Challenging Change. Check out (in alphabetical order) the poddie by visiting http://radiotoday.podomatic.com/ or http://www.1485.org.za/. 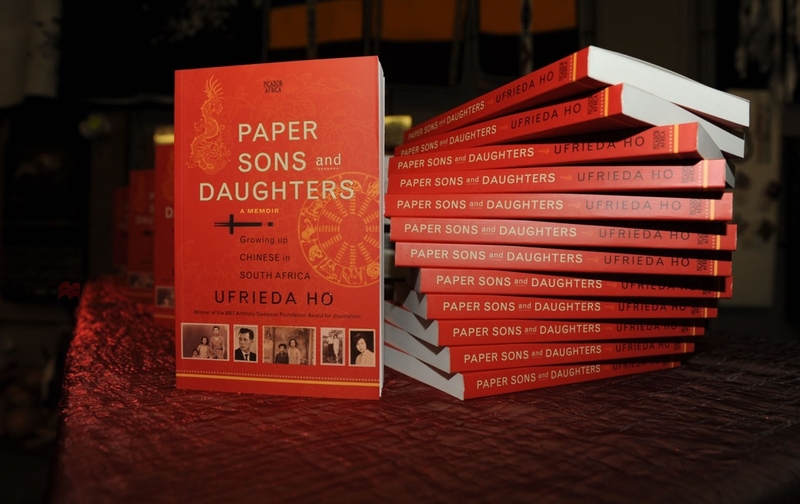 “Ufrieda Ho’s memoir and ode to her father is a colorful, richly textured and important tale of a South African family… a South African family with Chinese characteristics. The childhood sections, in particular, were written with such glorious detail, I could almost taste the food, visualize the overly decorated & crowed rooms & ramshackle gardens, and hear the music & the children’s giggles. In parts, I laughed out loud. In others, I teared up. And as a first-generation immigrant, the descriptions of her mother and father – the expectations, the values – resonated deeply. Having conducted over 70 interviews with other Chinese South Africans, I can attest to the veracity of the story and its now familiar lines. The ‘don’t make waves’ exhortations, the ‘work hard’ ethic, and ‘don’t bring shame’ attitude were constant, strong, often silent undercurrents of the way Chinese South Africans were forced to live their lives in the shadows and the in-between spaces carved out of the sometimes hazardous apartheid period of Ufrieda’s life. Her childhood tales of innocence/ignorance of growing up in the sheltered spaces of apartheid, with only inklings of the bigger (and much more violent) truths “out there” bring to mind Mark Behr’s “The Smell of Green Apples” and Joanne Fedler’s “The Dreamcloth”. However, unlike their novelized accounts, the Ufrieda’s readers get to learn her lessons at the end of apartheid. A stowaway hides for long weeks aboard a ship crossing the Indian Ocean. Leaving behind his village and his ancestors, he looks to the gold mountain in Johannesburg as an escape from his bleak life in devastated 1950s China. In South Africa he will become a “paper son”, a literal translation of the phrase used to refer to the illegal immigrants who bought or borrowed new identities from more established Chinese families to avoid detection by the authorities. He is full of quiet hope for what lies ahead as he sets foot in the Durban docks, but he will never lose the status of a second-class citizen. He is the geel gevaar, the yellow peril in apartheid South Africa, and he soon learns that the streets aren’t lined with gold. He can’t live where he chooses and won’t get the jobs reserved for whites. He becomes a fahfee man, the ‘ma-china’ of the black townships, running the illegal gambling game so perfectly suited to survival in the rot of South Africa’s policies of racial segregation. He is always avoiding the police, always looking to maximise his winnings and always trying to ensure a better life for his wife and four children – until one night in April 1993 when tragedy strikes. Winner of the 2007 Anthony Sampson Foundation Award for journalism, Ufrieda Ho is one of the daughters of this man, Ho Sing Kee. In this wonderfully textured memoir she explores her parents’ and grandparents’ arrival as illegal immigrants in South Africa, ready for a new life of putting “pap” on the menu and learning why “voetsek” doesn’t need much of an explanation. Ufrieda describes growing up with her siblings in a world of chopsticks and braais, dragons of the East and springboks of the South, fahfee and the family’s Ford Cortina. It is a world in which she is too white for some and too black for others, and the question of “who belongs” haunts these evocative stories of being Chinese in South Africa.